Now that our work at the church here has officially ended, it is time to finish packing and get on the road to return to the US. We will be traveling from Tuesday to Saturday (or beyond) to get back to Pensacola where we will call home for the next year. Today at the church service, we had a wonderful turn out of people. I don’t think a good count was ever gotten, but we had 30+ at the service and there were close to 20 other pastors, missionaries and friends who came by the church after their services were over. One pleasant surprise we had was that two of the main administrators at the local Deaf school came to the service this morning. These are two ladies who do not participate in a hands on way at the school, and therefore I rarely see them. But they are government officials who are in charge of the administrative tasks and are usually present for all the school functions when the public is invited. These ladies have been very kind to us and spoke very highly of the work that the Lord has helped us to build. They probably have very little understanding of all that we are trying to do, but they have been supportive in our efforts to provide spiritual guidance to the Deaf community. I have felt for some time that things have gone well with the ministry and that God will continue to bless the Greens and the work here. After today, I feel even more confident that we are able to walk away knowing that we have done what God has called us to do and that He will continue to build this work through other people. Thank you for praying for us and our ministry here in Merida, Mexico. We have been here a little over four years and it is time to pack up and head back to the US. At church today we have invited all the Deaf that we have been able to. Many are people with whom we have worked over the last few years. While we have seen many saved, there are still many that we have contacted and taught who have not accepted the Lord as their Savior. Today will be my last opportunity to share the Gospel with them. After the services this morning, we are going to have a meal at the church. Of course all those who are at the church will be invited to stay and we will also be joined by other missionaries and national pastors. We have worked for some time to transfer the authority of the church over to the other missionary family. All the people who regularly attend the church have been looking to Bill as the pastor for quite some time. It is those with whom I have personally built a relationship, who do not attend our church, that will be seeing this transfer of authority today. We are really wanting them to look to Bill and Jennifer as the ones they can contact to get spiritual help. I talk a bit about our departure in the latest episode of the Missionary Talks podcast. If we are not too worn out and frazzled at the end of the day, I will try to give a report with a couple of pictures. Today we were privileged to baptize one of our recent converts. She is a lady who was saved in March. She came to our church after seeing me put an invitation flyer in a neighbor’s gate. She is wheelchair bound because of polio, but sent a friend across the street to grab the flyer and find out what the American in the neighborhood was promoting. The first Sunday she was with us was a special day we had in February. You can read more about Magi’s salvation in an earlier post. Recently Bill (the other missionary we work with) has been teaching on baptism. Magi told us in church last Sunday that she wanted to be baptized before we left for the US. She stated that since she got on the path to coming to church and ultimately finding the Lord because of that one flyer I placed in a gate, she wanted me to be part of her baptism. Today we were able to go to another church with a baptistery and baptize Magi. Since she is in a wheelchair, we put her in a plastic chair in the water and tipped her backwards. I have not been part of too many baptisms, but I can assure you this one will not be soon forgotten. It was an honor to be a part and that she felt so strongly in honoring us in this way. In the video, Bill is the one who actually performs the baptism and he asks me to pray at the end. Of course this is all done in Spanish and in Mexican Sign Language. We have seen several visitors in church over the last couple of months. Many of them have come as a result of a tract distribution program we are doing. It is exciting to see people in church because someone randomly handed them a tract. Of course we know nothing is random when God is guiding our steps. We are right between our two weeks of camp for the summer. 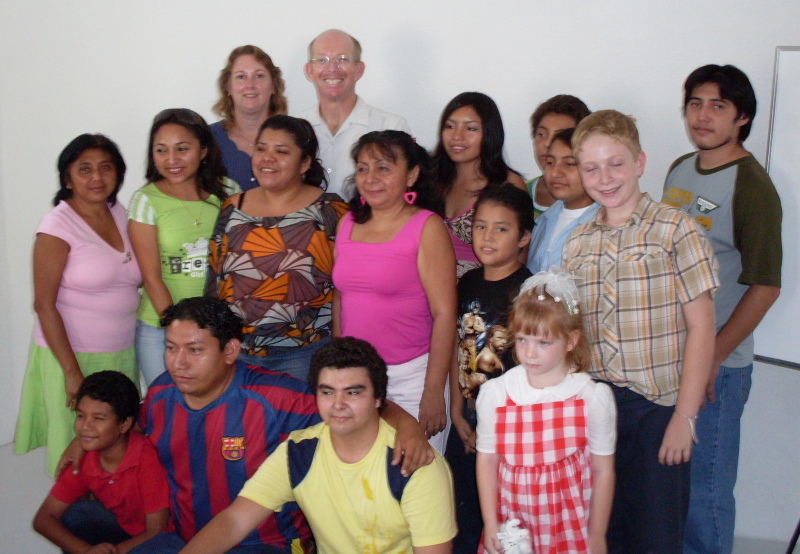 The first week was held July 21 to 25 near Saltillo, Mexico. The village we were in was at 7,000 feet elevation which meant that it was very cool all week. A pleasant respite from the heat we experience in Yucatan. There were 109 campers for the week. This is the largest group we have had in the last several years. It is exciting to see the camp growing through word of mouth in the churches. We do no advertising except trying to get the churches that currently attend to spread the word. One lady was saved on Tuesday at camp. It was exciting to see her beaming all week with a clear understanding of salvation. Wednesday night I was privileged to lead 2 ladies to the Lord in my class. I taught a class which contained people who did not know sign language well either because of lack of education or intelligence. There were seven in the class. That same night there were 2 who accepted the Lord in the main service. On Thursday there were again two others who accepted the Lord. In all we saw 7 people saved at camp. Our next week of camp will be here in Yucatan, August 12 to 15. This will be our first overnight camp here in Yucatan. Last year we did a day camp which went very well. We are expecting around 20 people for that camp. Pray with us that God will give wisdom in preparing for and running the camp. It is hard to believe that we will be returning for furlough in less than one month. We have booked several meetings with supporting churches to report on the work that God has allowed us to do. If your church has not contacted me about a specific date that you would like to have us, there is still time. I have started calling churches in groups based on location. If I have not called your church yet, I will be calling soon. We are very excited about seeing the many friends we made when visiting your church the first time. We do need to raise new support while we are back in the US. If you or your church receives our prayer letter but do not currently support us, we would be honored to be part of your team. Our scheduled return will be sometime the last week of August with meetings starting the middle of September. Please pray with us as we will be looking to replace our vehicle (which has 285,000 miles on it) as soon as we can. If you are aware of a good travel vehicle which gets pretty good gas mileage and is for sale for a very reasonable price, please let us know. See the previous post about camp for a picture of the seven who were saved.